Here is a child's vinyl back pack. This back pack features 2 shoulder straps and 1 carrying handle. Zippered closure of top. The backpack area is 3" deep x 7 1/2" high x 8 3/4" wide. 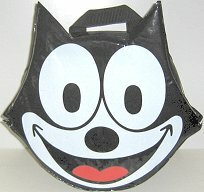 The Felix face on top means the pack pack is a bit wider and higher. Not recommended to carry heavy items. Item is new but discontinued by the manufacturer so we only have 1.